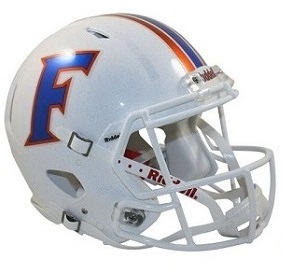 This is an Authentic University of Florida Speed Helmet by Riddell. This full-size helmet features the authentic Riddell Speed helmet design. It is designed with extended jaw area protection, a polyvinyl-coated steel face mask, 4-point chin strap, increased padding, an integrated facemask attachment system and elliptical air vents. Great for autographs and display. Not to be worn. Helmet size is 13.5"(L) x 9.75"(W) x 10.25"(H). 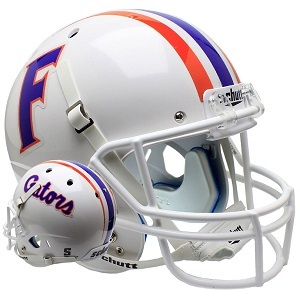 This University of Florida Authentic XP Helmet by Schutt features a traditional standoff helmet shell with a metal faceguard, an authentic interior TPU cushioning set complete with TPU jaw pads and ION hard cup chin strap. The XP helmet is Schutt's new state-of-the-art design, engineered to provide greater player head protection. For display only - not to be worn. 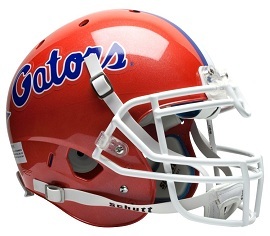 This is a full-size replica of the Florida Gators Speed Helmet by Riddell. The helmet has the same great features as the authentic Gators Speed Helmet but does not include the full interior padding ... just molded foam jaw pads. Great for autographs and display. Not to be worn. This is the Florida Gators Alt. White XP helmet by Schutt. Both the Authentic and the Replica feature a full-size AiR XP helmet shell with a polyvinyl-coated steel faceguard, 4-point chin strap and authentic Florida helmet decals. The Authentic has the complete interior TPU cushioning set complete with TPU jaw pads and ION hard cup chin strap. The Replica just has molded foam jaw and neck pads. Great for autographs and display. Not to be worn or used for play. Authentic: $179.95 ..... Replica: $99.95 .... both with Free Shipping! This is a full-size replica of the Florida Gators Alt. White Speed Helmet by Riddell. The helmet has the same great features as the authentic Gators Speed Helmet but does not include the full interior padding ... just molded foam jaw pads. Great for autographs and display. Not to be worn. 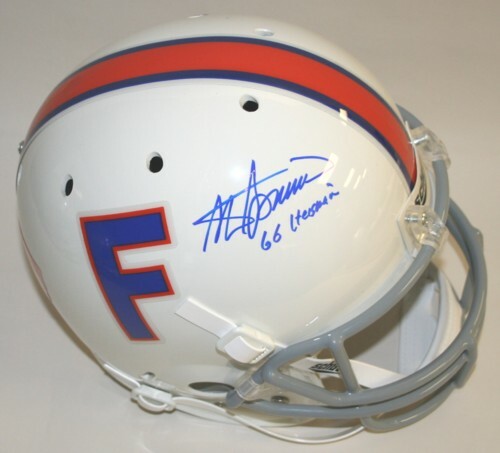 Full-size Florida Gators 1966 Replica Throwback Schutt Helmet hand-signed by Heisman winner, Head Coach and College Hall of Fame player and coach, Steve Spurrier. Inscription reads "66 Heisman". Comes with a Certificate of Authenticity from Victory Collectibles featuring their tamper-resistant holgram. Spurrier's accomplishments in his 52-year career as a player and head coach are too numerous to mention here, but you can read his history at Wikipedia. 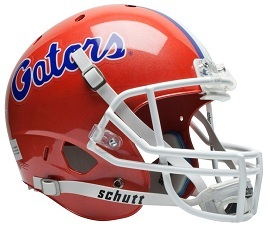 This is a full-size replica of the authentic Florida Gators XP football helmet by Schutt. 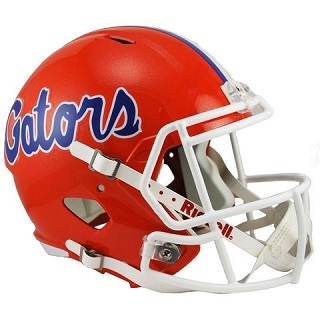 It features an authentic steel faceguard, 4-point chinstrap and official Gators helmet decals. For display only - not to be worn. 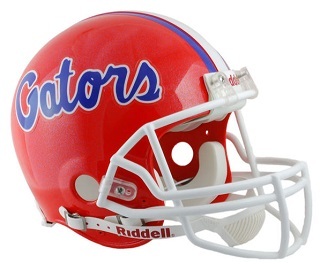 This is an Authentic Florida Gators VSR4 ProLine Helmet by Riddell. 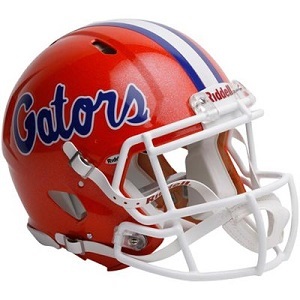 It features a polycarbonate size large shell, polyvinyl-coated steel Z2B facemask, authentic full interior padding, 4-point chinstrap and official Gators helmet decals. Approx. 10" tall. For display only. Not to be worn. 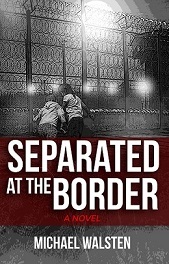 "A Wild, Inspired, Heart-Wrenching Read"
"A Triumph of a Debut Novel"
"Diamond Herrera is an Inspiring Female Lead"